Thinking of getting a new gun for cqb. I currently have a g and g m4 firehawk what does the job pretty well and a good pistol also. I'm looking for a gun with slightly more range possibly as some sites I play at have long open parts and my current gun doesn't all cut it when it comes to shots like that. I'm looking to spend £200 and under and was seeing what people were recommending. Spend it on that gun, you are not going to be any better if with another RIF. The good thing about the Firehawk is it's made by G&G so you have a pretty good base. Get a mock silencer and extend the inner barrel to around 285-300mm. Get a ZCI or Prometheus E.G. stainless barrel. Check your air seal and that the bucking is clean and dry, and undamaged, otherwise replace it with a new G&G green. Hop and inner I get but how is trigger response going to help with range ? Bit confused by that one . And, if one goes down you have a spare. Try a CM18 or a GR15 Raider with metal rails (longer than the Firehawk (about £175 in UK or £155 from Poland) or get a metal receiver GC16 from Gunfire for about 200. Or if you fancy a change, try one of the Specna Arms that have quite a following. They have a big range, mostly metal, and are very reasonably priced.. He doesn't really want a CQB gun, as he already has an excellent one. He wants something with more range. He appears to want something with a longer barrel. Assuming he isn’t on the edge of his FPS limits, a tightbore barrel of the same length and a bucking will be all you need. Maple leaf 60d bucking/ omega nub, G&G green or a modify rykotbdkkfj whatever it’s called flat bucking and nub. .25-28’s and it will shoot well. For cqb though a firehawk is great, too bloody loud but I have seen those things keep up range wise with any other cqb weapon. I would listen to the advice here, for £200 your not going to get a great gun for cbq, certainly no better than what you have so either save up some more or put in towards upgrades/bits for the hawk! In fact, they have loads under £200 that will work for what he wants. Thought generally the Krytac, EVO £350ish mark was more the better stuff compared to a firehawk. You don't have to buy a Krytac or an EVO to get better range for a CQB field though. A £200 Specna and a Maple Leaf hop rubber will be more than good enough for most places! Well I stand by what I have said. 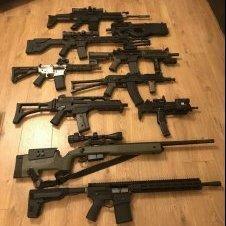 I believe the OP really wants to add another gun to his current collection of one. How many of us don't like to buy a new gun? Of course I could be completely wrong, in which case I expect he will reply and correct me. Krytac, G&P, VFC etc doesn't necessarily translate to more success at CQB. I mean it's very close range stuff. The skill and agility of the player is far more important than the brand of weapon he is using. There are plenty of decent guns under £200. Specna metal guns are excellent value, but if you are prepared to accept polymer actions, there are lots of other solid offerings from ICS, G&G, Classic Army etc. The Firehawk is polymer for that matter. Sites: Anzio, The Mill Wigan, Invasion Stockport. Would have to be the best of both worlds for me, got to be the scorpion evo, that thing is a beast. In fact its my next purchase! As above if the budget was higher it’ll be a scorpion evo all day long. Ok, just had a look and I didnt realise how cheap firehawks were..